While I was in Washington Square, I visited Judson Church, which was built around 1890, and is known for its social activism. It’s a Baptist church, named after a Baptist missionary (Adoniram Judson), and financed by Baptist John D. Rockefeller, Sr.1 It was situated downtown, to minister to the working classes. At the church, I met an 84-year-old man who had cycled to the church that morning from his Brooklyn home. He said that, years ago, he and his wife had bought a house in one of Brooklyn’s black neighborhoods. He had cycled in various parts of the world, and even across the U.S. When crossing the U.S., he followed a route mapped out by Adventure Cycling, which maps bike routes throughout the U.S. (A bike route might make an interesting driving route — more interesting than a long, straight highway.) Sometimes he arranged lodgings through churches. If he wanted to stay with an affluent family, he would contact an Episcopal church; if he wanted to stay with a poor family, he would contact a Pentecostal church, etc. He also arranged lodgings through Servas Open Doors, an international hospitality association. One of the most charming buildings I encountered in my wanderings was the India House in lower Manhattan. The India House was built around 1850 as a bank and is now a social club. The architectural style is called Renaissance, and the building has an effortless variety: rounded window hoods on the first floor, pointed window hoods on the second, and smaller, unadorned windows on the third. 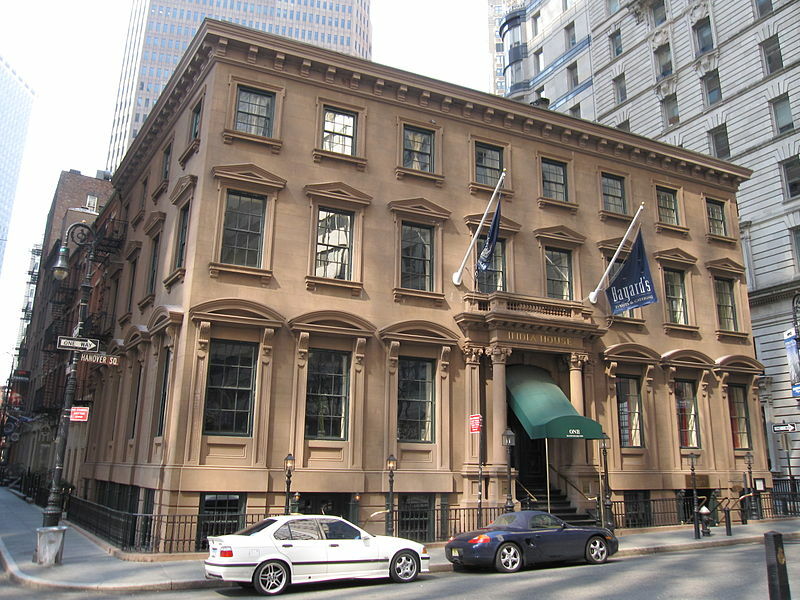 Another New York social club, also in the Renaissance style, is the Metropolitan Club. 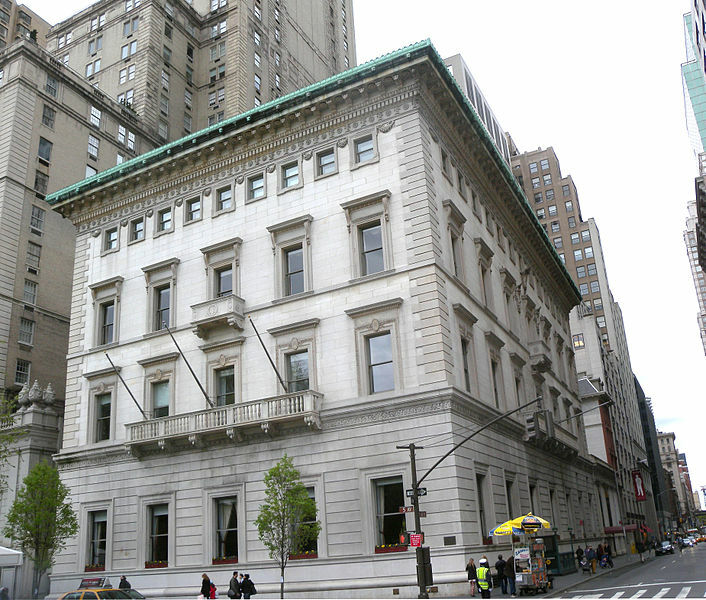 Built on 5th Avenue and 60th Street around 1890, the Metropolitan Club is more ornate, but less charming than the India House. Like the India House, its top-story windows are smaller and simpler than its other windows. 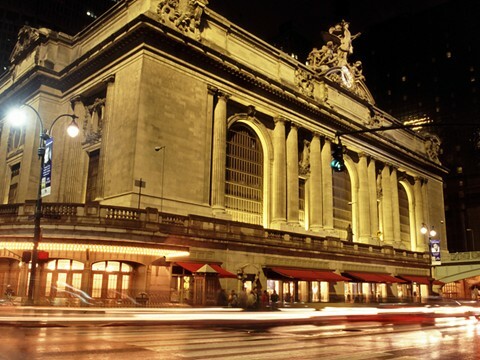 One of the most impressive buildings in New York is Grand Central Station. The huge lobby, whose ceiling is adorned with constellations, is often praised. Perhaps even more impressive is the facade, which is topped with a sculpture of Mercury & Company. This sculpture gives life to the whole facade, changing its shape and outline. There are many sculptures adorning many buildings, but few as effective as this one. Grand Central was built around 1910 in the Beaux-Arts style. A. Google Sky, and similar apps, allow you to point a smartphone at a star/constellation, and get information about it. Why not an architecture app that allows you to point your phone at a building (or a group of buildings), and get information about it? It should be possible to make such an app for Manhattan or Paris or any city of architectural interest. C. I discovered an American novelist, Nathanael West. His real name was Nathan von Wallenstein Weinstein. He was born in 1903, and died in a car accident at age 37. His death may have been a “willed death,” a quasi-suicide, prompted by the recent death of his friend F. Scott Fitzgerald. Like Fitzgerald, West spent part of his career in Hollywood, writing screenplays. He attended Brown University, where he was friends with the comic writer S. J. Perelman. West’s writing has been described as “a sweeping rejection of political causes, religious faith, artistic redemption and romantic love.” Perhaps his best-known works are the novels Miss Lonelyhearts (set in Manhattan) and The Day of the Locust (set in Hollywood); both these novels have been made into movies. E. Will the Taliban (and other such organizations) flourish or die out? Their most valuable asset is truth, philosophy. If they have truth on their side, they will continue to gain adherents; if their philosophy is more attractive than competing philosophies, they will prosper. Our strongest weapon against them is a philosophy that’s both true and attractive, though such a philosophy would take decades to have an effect. F. In an earlier issue, I discussed the decline of Christianity in Europe, and I quoted an English cleric who said, “Europe is no longer Christian.” A recent article in the New York Times discussed the decline of Christianity in the U.S. — more specifically, the decline of Protestant Christianity. Whites are especially prone to abandon Protestant churches, and “when they leave, instead of switching churches, they join the growing ranks who do not identify with any religion. Nearly one in five Americans say they are atheist, agnostic or ‘nothing in particular.’” This is “a seismic shift from 40 years ago, when about 7 percent of American adults said they had no religious affiliation.” I regard the decline of Christianity as a positive trend, and hope to see similar declines in other monotheistic creeds, like Judaism and Islam. The decline of such creeds will encourage the spread of new worldviews, worldviews more in tune with modern life and modern knowledge, worldviews that bring people together instead of dividing people. G. Remember the Oxfordian movie, Anonymous, that came out a year ago? The director, Roland Emmerich, is backing a new Oxfordian documentary, Last Will. & Testament. Click here for the trailer. For more info about the documentary, click here or here. H. Jacques Barzun died recently at the age of 104. Perhaps his most popular book was a book he published at age 93: From Dawn to Decadence: 500 Years of Western Cultural Life, 1500 to the Present. I. I’m now reading a history of the 20th century: Niall Ferguson’s The War of the World. It’s hard to put down, a good blend of popular and scholarly. Ferguson has broad knowledge and fresh ideas. He writes a bit hastily, his books don’t have the literary merits of George Kennan’s, but who describes modern times better? J. As I explained in an earlier issue, I use MicrosoftWord for word-processing partly because of its AutoCorrect feature, which can function as a shorthand system. By typing py, for example, I get “philosophy,” and by typing fe I get “for example.” If you have 50 or 100 of these shortcuts, it makes typing easier. GoogleDocs (also called GoogleDrive) now offers this feature (under Tools ==> Preferences); they call it “Automatic substitution.” But Gmail doesn’t offer it yet, and even in GoogleDocs, you can’t import your list of shortcuts. So Google is moving forward, but slowly. Moral judgment is as basic to reading a novel as a foundation inspection is to the purchase of a new home. It is, however, undervalued in literary culture today. Perhaps the main reason American fiction is in decline is that its moral component is neglected — both by writers and critics. It is never discussed in the creative writing workshops, which consequently limits their effectiveness as “feeders” of contemporary fiction. Another literary website I found is called The Millions. Its motto is “Who says lit coverage can’t survive online?” The site was started by Max Magee. The site’s name is a play on Magee’s first name, Maximilian. Consider also goodreads.com, which has quizzes, recommendations, etc. I’m proud to say that I got 13 out of 14 questions on the Walden quiz. (The question I missed was “What is the title of the second chapter of Walden?” I put “How I Lived” but the correct answer is “Where I Lived, and What I Lived For.”) I won’t mention my score on the Passage to India quiz. And finally, I found the website of the National Book Critics Circle. David Brooks says, �I have to again recommend the website The Browser, edited by Robert Cottrell, which gathers eloquence from far and wide day after day.� According to the Weekly Standard, Futility Closet is �one of the most interesting websites on the internet.� A popular economics blog is Marginal Revolution. In the last issue, I discussed the first debate, and said that Obama would be better prepared for the second and third debates. I predicted that the second and third debates wouldn’t affect the polls much, and Obama’s slight lead in the polls would persist until election day. This analysis implied that Obama was likely to win. It also implied that nothing could move the polls except debates (since TV ads would cancel each other out, and stump speeches would cancel each other out). Of course, an external event, such as an Israeli strike on Iran, could move the polls, but such an event is unlikely. I overlooked a key factor: momentum. Romney not only enjoyed a bounce from the first debate, he also acquired momentum, and soon Obama’s slight lead evaporated, and Romney had a slight lead. Some undecided voters seem attracted by momentum; momentum seems to feed on itself. Hence Romney was eager to claim momentum, and to say he was optimistic, while Obama supporters insisted that Romney’s momentum wasn’t genuine, but was a creation of his campaign. The polls vary widely. Each side believes the polls that support them, so each side is confident of victory. On election night, one side will be not only disappointed, but surprised. Has there ever been an election like this — an election where both sides are so confident that they start to pity the other side, where both sides can point to polls and statistics that support their belief? The poll expert for the New York Times, Nate Silver, gives Romney only a 21% chance of winning the electoral college, and only a 24% chance of winning the popular vote. The prediction market Intrade gives Romney a 34% chance in the electoral college, and a 40% chance in the popular vote. With these odds, I think Romney is a good bet. Perhaps the country’s biggest problem is the debt/deficit problem. Romney may be the perfect person to deal with that, since he spent his career trying to turn around failing businesses, trying to bring them from the red into the black.4 The country’s other big problem is the rising cost of healthcare. Here again Romney seems to have relevant experience: as Governor of Massachusetts, he passed more revolutionary healthcare reform than any other Governor. Conservatives are troubled by its high costs, but it’s certainly a bold experiment, and the current Governor of Massachusetts is hopeful that costs can be brought down, and the system can become a model for the nation. Perhaps what the country needs most is structural reform of entitlements, and no American politician has worked on this more than Romney’s running-mate, Paul Ryan. So after prolonged deliberation, Phlit is giving its coveted endorsement to Romney-Ryan. I recently read Raymond Chandler’s The Big Sleep (e-text here). The plot is somewhat confusing, and the novel has a sordid atmosphere, but on the whole, I enjoyed it. There were times when I felt, like one of Chandler’s characters, that “The smart thing for me to do was to take another drink and forget the whole mess,” but the ending is good, and there are many good critical essays on the novel. As you’ve heard me say before, the essays were more interesting than the novel itself — you should read the novel in order to understand the essays. Chandler can’t be dismissed lightly. Writers like Somerset Maugham and Evelyn Waugh had a high opinion of Chandler, and even called him the best American novelist of his time. Chandler’s protagonist, the detective Philip Marlowe, deals with various moral questions; The Big Sleep has been praised by business schools as offering a model of professional ethics. Chandler still has fans today, and I’ve received e-mails telling me that I should try him. Many academics are interested in Chandler. The hard-boiled school is a sharp departure from the English school of Agatha Christie, Dorothy Sayers, etc. The English school depicts a peaceful, orderly world, often a country house, and a lone criminal who disrupts this Eden. The clever detective unravels the mystery with no risk to himself, exposes the criminal, and restores peace. This is very annoying to people of what is called discernment. They do not like it that penetrating and important works of fiction of a few years back stand on their special shelf in the library marked “Best-Sellers of Yesteryear,” and nobody goes near them but an occasional shortsighted customer who bends down, peers briefly and hurries away; while old ladies jostle each other at the mystery shelf to grab off some item of the same vintage with a title like The Triple Petunia Murder Case, or Inspector Pinchbottle to the Rescue. They do not like it that “really important books” get dusty on the reprint counter, while Death Wears Yellow Garters is put out in editions of fifty or one hundred thousand copies. Chandler had a lively sense of humor. After watching him mimic Hollywood personalities, his friends agreed that, if he weren’t a professional writer, he could have been a professional entertainer. If one considers Hammett’s novels and Chandler’s novels as one body of work, an interesting pattern emerges. Hammett’s first two novels feature a detective who works for a firm, but his third novel features a detective who owns his own firm, and has no employees except one secretary. Chandler’s first novel, The Big Sleep, takes this trend one step further; it features a detective who has no employees at all. This trend toward independence mirrors a trend in the lives of the authors. Hammett worked for the Pinkerton Detective Agency, then later became a self-employed writer. Likewise, Chandler worked for an oil company, then later became a self-employed writer. In The Big Sleep, Marlowe is hired by an oil tycoon, General Sternwood, whose life has become complicated as a result of his two daughters. But Marlowe himself is independent, and has no romantic entanglements. So Hammett and Chandler are presenting a picture of the American male as free and independent in his professional life and his personal life. Is this freedom part of the allure of the hard-boiled school of detective fiction? As Chandler grew older, independence seemed to become less attractive to him. After his wife’s death, he tried to find a relationship that would alleviate his loneliness — like Poe after his wife died. Poe focuses on plot, as does Agatha Christie and other representatives of the English school. Hammett and Chandler focus more on character, and explore moral questions such as what the detective is willing to do for a client, when he will accept payment, etc. Chandler said that the English school emphasizes plot, and how the story is resolved at the end, but the hard-boiled school is interested in scenes, and believed that you could have a good crime novel even if the end were missing. Perhaps the most memorable scene in The Big Sleep is the gambling scene in which Vivian Regan is winning at the roulette table. But even this scene can’t match the gambling scene in Pushkin’s “Queen of Spades.” Pushkin explores the power of fate, the power of occult forces, unconscious forces, but Chandler stays closer to the surface, and doesn’t explore the depths. Chandler may do a fine job of exploring the ethical choices faced by his protagonist, but he doesn’t explore the murky world below consciousness, below ethics. Down these mean streets a man must go who is not himself mean, who is neither tarnished nor afraid. The detective in this kind of story must be such a man. He is the hero, he is everything. He must be a complete man and a common man and yet an unusual man. He must be, to use a rather weathered phrase, a man of honor, by instinct, by inevitability, without thought of it, and certainly without saying it. Both tell of idealists whose adventures seem destined to bring them in contact with some kind of truth, but who in fact find only a hollowness and a horror. Significantly, both these lovers of truth learn that the only way to deal with the horror they have exposed is to bury it once again with a lie, a lie that leaves the hero perhaps wiser, but also more bitter; and a lie that leaves the evil fundamentally untouched. You simply can do nothing, neither great nor little, not a thing in the world.... Youth, strength, genius, thoughts, achievements, simple hearts — all dies.... No matter. We saw such pessimism earlier, when we discussed the American novelist Nathanael West. It seems to be common among the writers of this period. Some readers find anti-Semitism in Chandler’s description of the owner of a store that sells jewelry on credit: “a tall handsome white-haired Jew in lean dark clothes, with about nine carats of diamond on his right hand.” Anti-Semitism is often encountered in the literature of the early 1900s. In an earlier issue, I discussed anti-Semitism in the work of D. H. Lawrence. The main villain in The Big Sleep is Eddie Mars, whom Marlowe describes as “a pornographer, a blackmailer, a hot car broker, a killer by remote control, and a suborner of crooked cops.” Is it not significant that Mars is described as having a “hooked nose”? Isn’t Chandler insinuating that Mars is Jewish?